The most consistently successful bunch rot control programs will not simply rely on Botrytis-specific fungicides but will integrate cultural methods like fruit zone leaf removal. 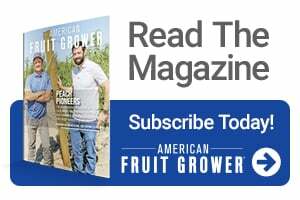 The practice of leaf removal for bunch rot control is based on concepts developed many years ago by researchers examining its effects on fruit zone microclimate and carbohydrate limitation for fruit set, among other things. Removal of leaves from nodes in the fruit zone increases sunlight exposure, air circulation, and pesticide penetration. This creates a fruit zone environment that is much less conducive to the development of Botrytis and other harvest rot-inducing microorganisms that prefer to do their dirty work in darkness, still air, and high humidity. 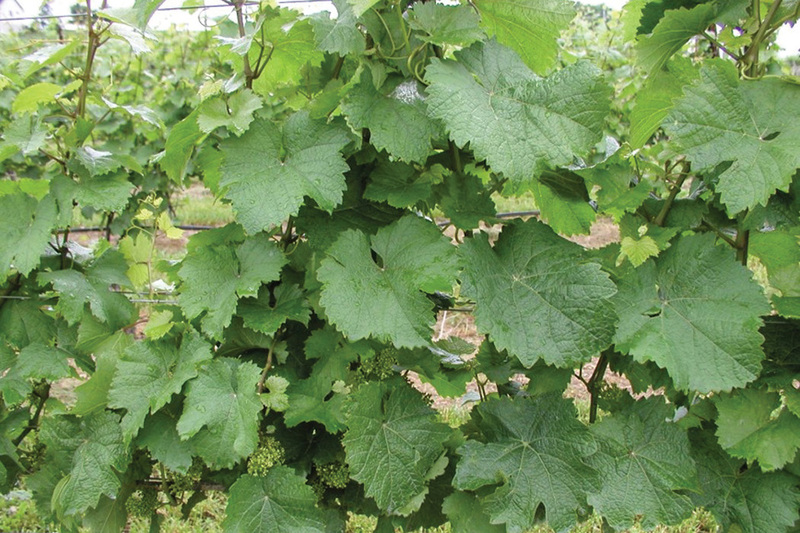 Fruit zone leaf removal has generally been applied between fruit set and veraison. But there is a growing body of information being developed around early fruit zone leaf removal (ELR) and its effects on the development of Botrytis bunch rot and sour rot. ELR is the removal of leaves in the fruit zone before, or at the beginning of bloom, and interest in this practice has increased in different areas of the world in recent years. Recent research by Stefano Poni and his colleagues at Università Cattolica del Sacro Cuore in Italy details the effects of ELR on crop load, disease control, and fruit and wine quality, especially for late-season bunch rots. Here in the U.S., research to study the effects of ELR is being conducted in Michigan and Pennsylvania, among other areas. But why is there added interest in ELR for bunch rot control? Taken together, ELR combines the benefits of an improved fruit zone environment with less susceptible clusters and generally greater reductions in bunch rot development than what would be achieved with post fruit set leaf removal, which would not, theoretically, reduce cluster compactness. When we examined ELR for six consecutive seasons in our experimental ‘Chardonnay’ vineyard, we found that we could eliminate two Botrytis-specific fungicide sprays and achieve harvest rot control that was equivalent to, or better than, a full Botrytis spray program (four sprays). But there are potential drawbacks to ELR. The reduction in berry number per cluster generally results in a reduction in cluster weight and, potentially, yield. This can be a downside to ELR where yield reduction is unacceptable to production goals. However, over the course of the six years in our ‘Chardonnay’ experiment, we were able to minimize or eliminate yield reduction by ELR, while maintaining bunch rot reductions. 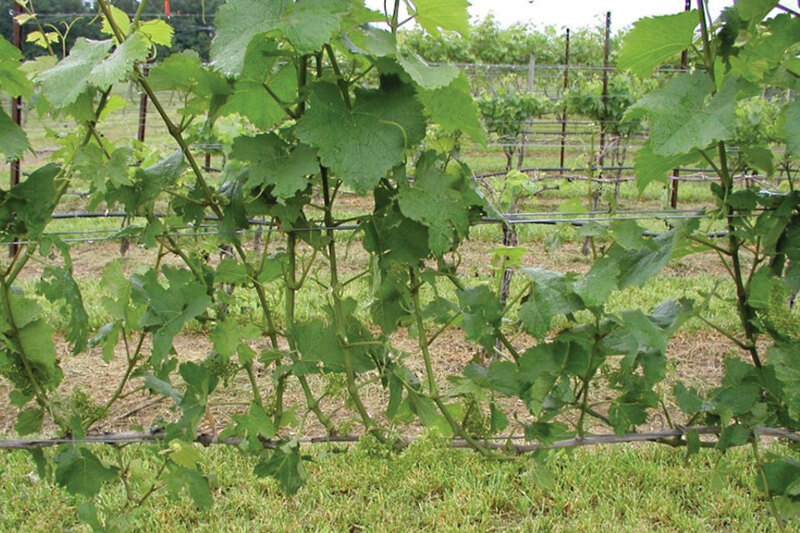 We did this through slight downward adjustments in the amount of leaf tissue removed — say four leaves removed per shoot, instead of five — and by minimizing the use of wood with nodes that had been defoliated the previous season by leaving two non-defoliated shoots at the head of the vine for renewals the following year. Therefore, reductions in yield by ELR can be managed to some extent. In terms of reducing compactness and bunch rot, ELR may be more effective in some seasons than others, and on some varieties than others. There is a level of inconsistency with this method; sometimes the rot reductions are significant when compared to no leaf removal, and sometimes they aren’t. It should also be noted that though ELR generally reduces rots more than leaf removal after fruit set, the numerical reductions are seldom significant. More recently, research with ELR has been taken a step further to examine the mechanization of this practice; manual leaf removal is expensive and time-consuming, and timing can be critical. Experiments over the past several years in Europe and the U.S. have shown that the use of air pulse leaf removal technology can remove enough fruit zone leaf area — about 35% to 50% of that which would be achieved by hand removal — to mimic the effects of manual leaf removal. This technology appears to work most efficiently — removing the most leaf tissue in the fruit zone — on more upright, two-dimensional training systems like vertical shoot position, when compared to more three-dimensional training systems like single, high-wire, no-tie systems. Mechanization is often the key to greater adoption of a practice, but only if it improves economic sustainability. An air-pulse leaf removal system can represent an investment of tens of thousands of dollars; that’s hardly cost effective for operations with just a few acres to treat per season. However, large farms that have lots of acres to treat may benefit through mechanization. Also, in regions where there is a concentration of wine grape acreage, such as Lake Erie or the Finger Lakes, this machinery could be shared, or the work contracted, to ease the capital investment necessary on a per farm basis. ELR is not a silver bullet. Instead, consider it some potential buckshot in a silver shotgun shell that is still under development; it can be an important component of an effective, integrated bunch rot control program. If you have bunch rot-susceptible varieties such as those mentioned above and would like to apply this practice in your vineyard, we recommend you test it out on a few vines first and compare the results to the rest of your vineyard — all other things being equal — to see if this is something that will work for you. Hed is a Research Technologist in the Department of Plant Pathology and Environmental Microbiology at Penn State University’s (PSU) Lake Erie Regional Grape Research and Extension Center in North East, PA. See all author stories here. Centinari is an Assistant Professor of Viticulture in the Department of Plant Science at PSU’s main campus in State College, PA. See all author stories here.